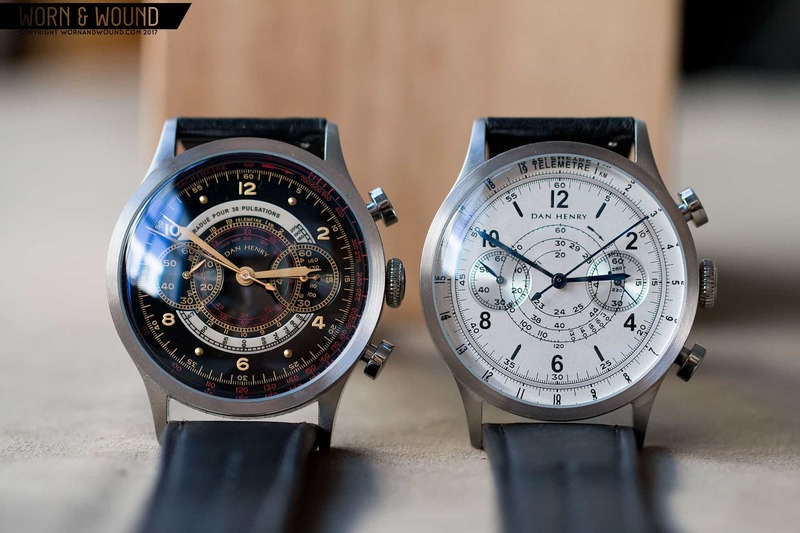 It’s been just a few months since the Dan Henry watches made their debut, which we wrote about here, but they’ve already made quite a name for themselves in the affordable watch market. Vintage-inspired homages to classic and sometimes obscure references, they are remarkably finished, stylish and well-priced. Sure, the low cost comes at the expense of the movements and crystals, which are largely quartz save the 1970 diver and mineral crystal all around, but the overall look and sheer fun of the pieces are in a class of their own at the price. Following the initial launch of four models, each with two versions, DH has brought out a new pair of chronographs, the 1939s. These multi-scale chronographs are based on the highly technical models by the likes of Tissots, Omegas, Breitlings, Eberhards and many others that featured spiral tachymeters, telemeters and even pulsometer all on the same dials. Unlike with previous models, the two 1939s aren’t the same watch in different colors, rather they are two totally different takes on the concept with one in a gloss black dial, the other in a matte silver, both for $220. Before getting to the dials, the case of the 1939 is visually similar to that of the 1947 model that I took an in-depth look at here, coming in slightly larger at 41 x 49 x 13mm, and with a different crystal shape, which is domed rather than boxed. That said, the general form is still the same, and emphasizes the high quality machining and finishing that makes these watches much feel costlier than $220. Obviously, you then have wide-topped pushers at two and four, which supply a great surface for pushing, and a flat onion crown. Rather than the more dramatic stamped case backs found on the original models, the 39 features temperature, fuel consumption, pressure and speed conversions tables, emphasizing the history of the chronograph as a tool for pilots. The black dial version is really something to behold, with an enamel-like sheen and highly detailed mix of colors, applied markers and over prints. It’s based closely on an Omega and like the dials of the 1947, just has a quality you don’t typically find at the price point. The use of color brilliantly divides up the information. The tachymeter is both on the outside edge of the dial and in the center of the dial, presented in a dark red that somehow stands out against the black surface. Then you have metallic gold print for the chronograph functions and telemeter. Playing off of this, the hour index is then a series of applied markers in gold, adding some depth to the dial. Lastly, you have the pulsations index printed on a wide ivory white layer that is clearly overprinted on the black, standing off the surface. This sudden break divides the dial between time and chronograph functions, and is simply very cool looking. The printing all around is crisp and clear, which is all the more impressive considering the small size of some of the type. The silver dial is more straightforward, but equally impressive in its execution. As mentioned, its actually a totally different design, not just a different color. It’s a bit simpler, with just black print on the steely-silver dial, and only two scales, a telemeter on the outer edge and a spiral-tachymeter in the center. The primary index is then a bolder, more pilot/military style with large arabic numerals alternating with fence-post shaped markers. Perhaps the detail that impressed me the most on this version was the blued hands. At the price, it’s very unlikely these are heat-tempered blue, but they really look it. Often faux-heat blue hands are too blue, almost sapphire colored. Real heat-blue often appears black in some light, blue in others, which these hands get very close to. On the wrist, the 1939s wear well. The 41mm size actually suits them, if larger than the originals. There is so much going on on the dials that the added size helps things breathe and be legible. That said, they do read on the large size as the dials are also quite wide. So they have a lot of wrist presence. Aesthetically, they are very successful as well, really getting across an early 20th century style in a modern package. Both are a pleasant mix of classic, formal styling, with the complexity and fun brought by the layers of scales. The black model in particular is quite striking on the wrist, and will definitely garner attention. In a world where a lot of fashion watch brands play in that $100 – $300 territory, a brand like Dan Henry can really shine. These are simply better than the competition, with more more intricate designs and higher-end executions. As said, that does come at the expense of the movement being quartz, but with what’s available these days, mechanical chronographs are priced so much higher than these that its excusable to make something fun and affordable. The 1939s are another great offering from the brand, adding that classic multi-scale chrono style to the line-up. So, if you’ve found yourself eyeing those old beatup watches from the 30’s on eBay and the like, but never wanted to pull the trigger because of the price or the condition they were in, the 1939’s will get you part of the way at a very reasonable price.